Imagine our friend Knut, who we have already introduced in earlier chapters of this book, hastily walking through his apartment looking everywhere for a gold medal that he has won many years ago at a swimming contest. The medal is very important to him, since it was his recently deceased mother who had insisted on him participating. The medal reminds him of the happy times in his life. But now he does not know where it is. He is sure that he had last seen it two days ago but, searching through his recent experiences, he is not able to recall where he has put it. So what exactly enables Knut to remember the swimming contest and why does the medal trigger the remembrance of the happy times in his life? Also, why is he not able to recall where he has put the medal, even though he is capable of scanning through most of his experiences of the last 48 hours? Memory, with all of its different forms and features, is the key to answering these questions. When people talk about memories, they are subconsciously talking about "the capacity of the nervous system to acquire and retain usable skills and knowledge, which allows living organisms to benefit from experience". Yet, how does this so-called memory function? In the process of answering this question, many different models of memory have evolved. Distinctions are drawn between Sensory Memory, Short Term Memory, and Long Term Memory based on the period of time information is accessible after it is first encountered. Sensory Memory, which can further be divided into Echoic and Iconic Memory, has the smallest time span for accessibility of information. With Short Term and Working Memory, information is accessible seconds to minutes after it is first encountered. While Long Term Memory, has an accessibility period from minutes to years to decades. This chapter discusses these different types of memory and further gives an insight into memory phenomena like False Memory and Forgetting. Finally, we will consider biological foundations that concern memory in human beings and the biological changes that occur when learning takes place and information is stored. In the following section we will discuss the three different types of memory and their respective characteristics: Sensory Memory, Short Term (STM) or Working Memory (WM) and Long Term Memory (LTM). While Iconic and Echoic Memory have been well researched, there are other types of Sensory Memory, like haptic, olfactory, etc., for which no sophisticated theories exist so far. It should be noted, though, that according to the Atkinson and Shiffrin (1968) Sensory Memory was considered to be the same thing as Iconic Memory. Echoic Memory was added to the concept of Sensory Memory due to research done by Darwin and others (1972). Let us consider the following intuitive example for Iconic Memory: Probably we all know the phenomenon that it seems possible to draw lines, figures or names with lighted sparklers by moving the sparkler fast enough in a dark environment. Physically, however, there are no such things as lines of light. So why can we nevertheless see such figures? This is due to Iconic Memory. Roughly speaking, we can think of this subtype of memory as a kind of photographic memory, but one which only lasts for a very short time (milliseconds, up to a second). The image of the light of a sparkler remains in our memory (persistence of vision) and thus makes it seem to us like the light leaves lines in the dark. The term "Echoic Memory", as the name already suggests, refers to auditory input. Here the persistence time is a little longer than with Iconic Memory (up to five seconds). At the level of Sensory Memory no manipulation of the incoming information occurs, it is transferred to the Working Memory. By ‘transfer’ it is meant that the amount of information is reduced because the capacity of the working memory is not large enough to cope with all the input coming from our sense organs. The next paragraph will deal with the different theories of selection when transferring information from Sensory Memory to Working Memory. One of the first experiments researching the phenomenon of Attention was the Shadowing Task (Cherry et al., 1953). This experiment deals with the filtering of auditory information. The subject is wearing earphones, getting presented a different story on each ear. He or she has to listen to and repeat out loud the message on one ear (shadowing). When asked for the content of the stories of both ears only the story of the shadowed side can be repeated; participants do not know about the content of the other ear’s story. From these results Broadbent concluded the Filter Theory (1958). This theory proposes that the filtering of information is based on specific physical properties of stimuli. For every frequency there exists a distinct nerve pathway. The attention control selects which pathway is active and can thereby control which information is passed to the Working Memory. This way it is possible to follow the utterance of one person with a certain voice frequency even though there are many other sounds in the surrounding. But imagine a situation in which the so called cocktail party effect applies: having a conversation in a loud crowd at a party and listening to your interlocutor you will immediately switch to listening to another conversation if the content of it is semantically relevant to you, e.g. if your name is mentioned. So it is found that filtering also happens semantically. The above mentioned Shadowing Task was changed so that the semantic content of a sentence was split up between the ears, and the subject, although shadowing, was able to repeat the whole sentence because he or she was following the semantic content unconsciously. Reacting to the effect of semantic filtering, new theories were developed. Two important theories are the Attenuation Theory (Treisman, 1964) and the Late Selection Theory (Deutsch & Deutsch, 1963). The former proposes that we attenuate information which is less relevant, but do not filter it out completely. Thereby also semantic information of ignored frequencies can be analyzed but not as efficiently as those of the relevant frequencies. The Late Selection Theory presumes that all information is analyzed first and afterwards the decision of the importance of information is made. Treisman and Geffen did an experiment to find out which one of the theories holds. The experiment was a revision of the Shadowing Task. Again the subjects have to shadow one ear but in contrast they also have to pay attention to a certain sound which could appear on either ear. If the sound occurs the subject has to react in a certain way (for example knock on the table). The result is that the subject identifies the sound on the shadowed ear in 87% of all cases and can only do this in 8% of the cases on the ignored side. This shows that the information on the ignored side must be attenuated since the rate of identification is lower. If the Late Selection Theory were to hold then the subject would have to analyze all information and would have to be able to identify the same amount on the ignored side as on the shadowed side. Since this is not the case the Attenuation Theory by Treisman explains the empirical results more accurately. Illustration of the Attention Control Model by a) Treisman - Attenuation Theory and b) Deutsch & Deutsch – Late Selection Theory. The Short Term Memory (STM) was initially discussed by Attkinson and Shiffrin (1968). The Short Term Memory is the link between Sensory Memory and Long Term Memory (LTM). Later Baddeley proposed a more sophisticated approach and called the interface Working Memory (WM). We will first look at the classical Short Term Memory Model and then go on to the concept of Working Memory. As the name suggests, information is retained in the Short Term Memory for a rather short period of time (15–30 seconds). With this strategy you bundeled eight pieces of information (eight digits) to three pieces with help to remember them as a date schema. A famous experiment concerned with chunking was conducted by Chase and Simon (1973) with novices and experts in chess playing. When asked to remember certain arrangements of chess pieces on the board, the experts performed significantly better that the novices. However, if the pieces were arranged arbitrarily, i.e. not corresponding to possible game situations, both the experts and the novices performed equally poorly. The experienced chess players do not try to remember single positions of the figures in the correct game situation, but whole bundles of figures as already seen before in a game. In incorrect game situations this strategy cannot work which shows that chunking (as done by experienced chess players) enhances the performance only in specific memory tasks. Baddeley and Hitch (1974) drew attention to a problem with the Short Term Memory Model. Under certain conditions it seems to be possible to do two different tasks simultaneously, even though the STM, as suggested by Atkinson and Shiffrin, should be regarded as a single, undivided unit. An example for the performance of two tasks simultaneously would be the following: a person is asked to memorize four numbers and then read a text (unrelated to the first task). Most people are able to recall the four numbers correctly after the reading task, so apparently both memorizing numbers and reading a text carefully can be done at the same time. According to Baddeley and Hitch the result of this experiment indicates that the number-task and the reading-task are handled by two different components of Short Term Memory. So they coined the term "Working Memory" instead of "Short Term Memory" to indicate that this kind of Memory enables us to perform several cognitive operations at a time with different parts of the Working Memory. Participants were again asked to say out loud "the, the, the ..." But instead of memorizing words from a list of short or long words, their task was to remember words that were either spoken to them or shown to them written on paper. The results indicated that the participants’ performances were significantly better if the words were presented to them and not read out aloud. Baddeley concluded from this fact that the performance in a memory task is improved if the two stimuli can be dealt with in distinct components of the Working Memory. In other words, since the reading of words is handled in the Visuospatial Sketch Pad, whereas the saying of "the" belongs to the Phonological Loop, the two tasks do not "block" each other. The rather bad performance of hearing words while speaking could be explained by the fact that both hearing and speaking are dealt with in the Phonological Loop and thus the two tasks conflict with each other, decreasing the performance of memorization. In theory all information has to pass the Working Memory in order to be stored in the Long Term Memory. However, cases have been reported where patients could form Long Term Memories even though their STM-abilities were severely reduced. This clearly poses a problem to the modal model approach. It was suggested by Shallice and Warrington (1970) that there must be another possible way for information to enter Long Term Memory than via Working Memory. As the name already suggest, Long Term Memory is the system where memories are stored for a long time. "Long" in this sense means something between a few minutes and several years or even decades to lifelong. Similar to Working Memory, Long Term Memory can again be subdivided into different types. Two major distinctions are made between Declarative (conscious) and Implicit (unconscious) Memory. Those two subtypes are again split into two components each: Episodic and Semantic Memory with respect to Declarative Memory and Priming Effects, and Procedural Memory with respect to Implicit Memory. In contrast to Short Term or Working Memory, the capacity of Long Term Memory is theoretically infinite. The opinions as to whether information remains in the Long Term Memory forever or whether information can get deleted differ. The main argument for the latter opinion is that apparently not all information that was ever stored in LTM can be recalled. However, theories that regard Long Term Memories as not being subject to deletion emphasize that there might be a useful distinction between the existence of information and the ability to retrieve or recall that information at a given moment. There are several theories about the “forgetting” of information. These will be covered in the section “Forgetting and False Memory”. Let us now consider the two types of Declarative Memory. As noted above, those two types are Episodic and Semantic Memory. Episodic Memory refers to memories for particular events that have been experienced by somebody (autobiographical information). Typically, those memories are connected to specific times and places. Semantic Memory, on the other hand, refers to knowledge about the world that is not connected to personal events. Vocabularies, concepts, numbers or facts would be stored in the Semantic Memory. Another subtype of memories stored in Semantic Memory is that of the so called Scripts. Scripts are something like blueprints of what happens in a certain situation. For example, what usually happens if you visit a restaurant (You get the menu, you order your meal, eat it and you pay the bill). Semantic and Episodic Memory are usually closely related to one another, i.e. memory of facts might be enhanced by interaction with memory about personal events and vice versa. For example, the answer to the factual question of whether people put vinegar on their chips might be answered positively by remembering the last time you saw someone eating fish and chips. The other way around, good Semantic Memory about certain things, such as football, can contribute to more detailed Episodic Memory of a particular personal event, like watching a football match. A person that barely knows the rules of that game will most probably have a less specific memory for the personal event of watching the game than a football-expert will. Participants were asked to read a magazine without paying attention to the advertisements. After that, different advertisements were presented to them; some had occurred in the magazine, others had not. The participants were told to rate the presented advertisement with respect to different criteria such as how appealing, how memorable or eye-catching they were. The result was that in general those advertisements that had been in the magazine received higher rankings than those that had not been in the magazine. Additionally, when asked which advertisements the participants had actually seen in the magazine, the recognition was very poor (only 2.8 of the 25 advertisements were recognized). This experiment shows that the participants performed implicit learning (as can be seen from the high rankings of advertisements they had seen before) without being conscious of it (as can be seen from the poor recognition rate). This is an example of the Priming Effect. As important as memory is, also the process of Forgetting is present to everybody. Why do we forget at all? One might come up with something you could call “mental hygiene”. It is not useful to remember every little detail of your life and your surrounding, but rather a disadvantage because you maybe would not be able to remember the important things as quickly or even quick enough but have an overload of facts in your memory. Therefore it is important that unused memories are “cleaned up” so that only relevant information is stored. What do we forget and how? The Trace Decay Theory states that you need to follow a certain path, or trace, to recall a memory. If this path has not been used for some time, one would say that the activity of the information decreases (it fades (->decays)), which leads to difficulty or the inability to recall the memory. Earlier memories influence new ones or hinder one to make new ones. Old memories are changed by new ones, maybe even so much that the original one is completely ‘lost’. Which of the two theories applies in your opinion? Do you agree with a mixture of the two? In 1885 Herrmann Ebbinghaus did several self-experiments to research human forgetting. He memorized a list of meaningless syllables, like “WUB” and “ZOF”, and tried to recall as many as possible after certain intervals of time for several weeks. He found out that forgetting can be described with an almost logarithmic curve, the so called forgetting curve which you can see on the left. These theories about forgetting already make clear that memory is not a reliable recorder but it is a construction based on what actually happened plus additional influences, such as other knowledge, experiences, and expectations. Thus false memories are easily created. It makes one see his or herself in the best possible light. Because of which one perceives his or her basic attitudes to remain persistent over time. It is cause for the fact that one perceives things to be generally improving. There are moments in our lives that we are sure we will never forget. It is generally perceived that the memories of events that we are emotionally involved with are remembered for a longer time than others and that we know every little detail of them. These kinds of memories are called Flashbulb Memories. The accuracy of the memories is an illusion, though. The more time passes, the more these memories have changed while our feeling of certainty and accuracy increases. Examples for Flashbulb Memories are one’s wedding, the birth of one’s child or tragedies like September 11th. Interesting changes in memory can also occur due to Misleading Postevent Information (MPI). After an event information given another person can so to say intensify your memory in a certain respect. This effect was shown in an experiment by Loftus and Palmer (1974): The subjects watched a film in which there were several car accidents. Afterwards they were divided into three groups that were each questioned differently. While the control group was not asked about the speed of the cars at all, in the other groups questions with a certain key word were posed. One group was asked how fast the cars were going when they hit each other, while in the other question the verb “smashed” was used. One week later all participants were asked whether they saw broken glass in the films. Both the estimation of speed and the amount of people claiming to have seen broken glass increased steadily from the control group to the third group. Based on this Misinformation Effect the Memory Impairment Hypothesis was proposed. This hypothesis states that suggestible and more detailed information that one receives after having made the actual memory can replace the old memory. Keeping the possible misleading information in mind, one can imagine how easily eyewitness testimony can be (purposely or accidentally) manipulated. Depending on which questions the witnesses are asked they might later on remember to see, for example, a weapon or not. If one cannot remember an event or detail it does not mean that the memory is completely lost. Instead one would say that these memories are repressed, which means that they cannot easily be remembered. The process of remembering in these cases is called recovery. Recovering of a repressed memory usually occurs due to a retrieval cue. This might be an object or a scene that reminds one of something which has happened long ago. Traumatic events, which happened during childhood for example, can be recovered with the help of a therapist. This way, perpetrators have been brought to trial after decades. Still, the correctness of the “recovered” memory is not guaranteed: as we know, memory is not reliable and if the occurrence of an event is suggestible one might produce a false memory. Look at the illustration to the right to be able to relate to these processes. How did the memory for an event become what it is? Other than on a daily basis errors in memory and amnesia are due to damages in the brain. The following paragraphs will present the most important brain regions enabling memory and mention effects of damage to them. In this section we will first consider how information is stored in synapses and then talk about two regions of the brain that are mainly involved in forming new memories, namely the amygdala and the hippocampus. To show what effects memory diseases can have and how they are classified, we will discuss a case study of amnesia and two other common examples for amnesic diseases: Karsakoff’s amnesia and Alzheimer’s disease. The idea that physiological changes at synapses happen during learning and memory was first introduced by Donald Hebb. It was in fact shown that activity at a synapse leads to structural changes at the synapse and to enhanced firing in the postsynaptic neuron. Since this process of enhanced firing lasts for several days or weeks, we talk about Long Term Potentiation (LTP). During this process existing synaptic proteins are altered and new proteins are synthesized at the modified synapse. What does all this have to do with memory? It has been discovered that LTP is most easily generated in regions of the brain which are involved in learning and memory - especially the hippocampus, about which we will talk in more detail later. Donald Hebb found out that not only a synapse of two neurons is involved in LTP but that a particular group of neurons is more likely to fire together. According to this, an experience is represented by the firing of this group of neurons. So it works according to the principle: “what wires together fires together”. The amygdala is involved in the modulation of memory consolidation. Following any learning event, the Long Term Memory for the event is not instantaneously formed. Rather, information regarding the event is slowly assimilated into long term storage over time, a process referred to as memory consolidation, until it reaches a relatively permanent state. During the consolidation period, memory can be modulated. In particular, it appears that emotional arousal following a learning event influences the strength of the subsequent memory for that event. Greater emotional arousal following a learning event enhances a person's retention of that event. Experiments have shown that administration of stress hormones to individuals, immediately after they learn something, enhances their retention when they are tested two weeks later. 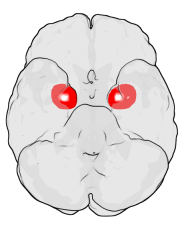 The amygdala, especially the basolateral nuclei, is involved in mediating the effects of emotional arousal on the strength of the memory for the event. There were experiments conducted by James McGaugh on animals in special laboratories. These laboratories have trained animals on a variety of learning tasks and found that drugs injected into the amygdala after training affect the animal’s subsequent retention of the task. These tasks include basic Pavlovian Tasks such as Inhibitory Avoidance, where a rat learns to associate a mild footshock with a particular compartment of an apparatus, and more complex tasks such as spatial or cued water maze, where a rat learns to swim to a platform to escape the water. If a drug that activates the amygdala is injected into the amygdala, the animals had better memory for the training in the task. When a drug that inactivated the amygdala was injected, the animals had impaired memory for the task. Despite the importance of the amygdala in modulating memory consolidation, however, learning can occur without it, although such learning appears to be impaired, as in fear conditioning impairments following amygdala damage. Evidence from work with humans indicates a similar role of the amygdala in humans . Amygdala activity at the time of encoding information correlates with retention for that information. However, this correlation depends on the relative “emotionality” of the information. More emotionally-arousing information increases amygdalar activity, and that activity correlates with retention. Psychologists and neuroscientists dispute over the precise role of the hippocampus, but, generally, agree that it plays an essential role in the formation of new memories about experienced events (Episodic or Autobiographical Memory). Some researchers prefer to consider the hippocampus as part of a larger medial temporal lobe memory system responsible for general declarative memory (memories that can be explicitly verbalized — these would include, for example, memory for facts in addition to episodic memory). Some evidence supports the idea that, although these forms of memory often last a lifetime, the hippocampus ceases to play a crucial role in the retention of the memory after a period of consolidation. Damage to the hippocampus usually results in profound difficulties in forming new memories (anterograde amnesia), and normally also affects access to memories prior to the damage (retrograde amnesia). Although the retrograde effect normally extends some years prior to the brain damage, in some cases older memories remain intact - this sparing of older memories leads to the idea that consolidation over time involves the transfer of memories out of the hippocampus to other parts of the brain. However, researchers have difficulties in testing the sparing of older memories and, in some cases of retrograde amnesia, the sparing appears to affect memories formed decades before the damage to the hippocampus occurred, so its role in maintaining these older memories remains controversial. As already mentioned in the preceding section about the hippocampus, there are two types of amnesia - retrograde and antrograde amnesia. Amnesia can occur when there is damage to a number of regions in the medial temporal lobe and their surrounding structures. The patient H.M. is probably one of the best known patients who suffered from amnesia. Removing his medial temporal lobes, including the hippocampus, seemed to be a good way to treat the epilepsy. What could be observed after this surgery was that H.M. was no longer able to remember things which happened after his 16th birthday, which was 11 years before the surgery. So given the definitions above one can say that he suffered retrograde amnesia. Unfortunately, he was not able to learn new information due to the fact that his hippocampus was also removed. H.M. therefore suffered not only from retrograde amnesia, but also from anterograde amnesia. His Implicit Memory, however, was still working. In procedural memory tests, for example, he still performed well. When he was asked to draw a star on a piece of paper which was shown to him in a mirror, he performed as bad as every other participant in the beginning. But after some weeks his performance improved even though he could not remember having done the task many times before. Thus, H.M.’s Declarative Memory showed severe deficits but his Implicit Memory was still fine. Another quite common cause of amnesia is the Korsakoff’s syndrome or also called Korsakoff’s amnesia. Long term alcoholism usually elicits this Korsakoff’s amnesia due to a prolonged deficiency of vitamin B1. This syndrome is associated with the pathology of the midline diencephalon including the dorsomedial thalamus. Alzheimer’s disease is probably the best known type of amnesia because it is the most common type in our society. Over 40 percent of the people who are older than 80 are affected by Alzheimer’s disease. It is a neurodegenerative disease and the region in the brain which is most affected is the entorhinal cortex. This cortex forms the main input and output of the hippocampus and so damages here are mostly severe. Knowing that the hippocampus is especially involved in forming new memories one can already guess the patients have difficulties in learning new information. But in late stages of Alzheimer’s disease also retrograde amnesia and even other cognitive abilities, which we are not going to discuss here, might occur. What is the distinction between Short Term memory and Working Memory? What is Long Term Memory and which brain area(s) are involved in forming new memories? Don’t forget why we forget! ↑ Atkinson, R. C. & Shiffrin, R. M. (1968). Human memory: A proposed system and its control processes. In K. Spence & J. Spence (Eds. ), The psychology of learning and motivation (Volume 2). New York: Academic Press. Evidence for brief auditory storage. Cognitive Psychology, 3, 255-267. ↑ Cherry, E. C. (1953). Some experiments on the recognition of speech with one and with two ears. Journal of Accoustical Society of America, 25, 975-979. ↑ Broadbent, D. E. (1958). Perception and communication. New York: Pergamon. ↑ Treisman, A. M. (1964). Monitoring and storage of irrelevant messages and selective attention. Journal of Verbal Learning and Verbal Behaviour, 3, 449-459. ↑ Deutsch, J. A. & Deutsch, D. (1963). Attention: Some theoretical considerations. Psycological Review, 70, 80-90. ↑ Miller, G. A. (1956). The magical number seven, plus or minus two: Some limits on our capacity for processing information. ↑ Goldstein, E. B. (2005). Cognitive Psychology. London: Thomson Leaning, page 157. ↑ Chase, W. G. & Simon, H.A. (1973). The mind’s eye in chess. In W. G. Chase (Ed. ), Visual information processing. ↑ Baddeley, A. D. & Hitch, G. (1974). Working memory. In G. A. Bower (Ed. ), Recent advances in learning and motivation (Vol. 8). ↑ Baddeley, A. D. (1986). Working Memory. Oxford: Oxford University Press. Evidence from image transformation tasks. Journal of Experimental Psychology: Learing, Memory, and Cognition, 18, 157-165. ↑ Shallice, T., & Warrington, E. K. (1970). Independent functioning of verbal memory stores: A neuropsychological study. Quarterly Journal of Experimental Psychology,22, 261-273. ↑ Perfect, T. J., & Askew, C. (1994). Print adverts: Not remembered but memorable. Applied Cognitive Psychology, 8, 693-703. An example of the interaction between language and memory. Journal of Verbal Learning and Verbal Behavior, 13, 585-589. ↑ Hebb, D. O. (1948). Organization of behavior. New York: Wiley. The eyewitness identification literature has developed a number of definitions and concepts that require explanation. Each definition and concept is described below. Fillers are people in the lineup who are not suspects. Fillers, sometimes called foils or distractors, are known-innocent members of the lineup. Therefore, the identification of filler would not result in charges being brought against the filler. A culprit-absent lineup is one in which an innocent suspect is embedded among fillers and a culprit-present lineup is one in which a guilty suspect (culprit) is embedded among fillers. The primary literature sometimes calls these target-present and target-absent lineups (Wells & Olson, 2003). A simultaneous lineup is one in which all lineup members are presented to the eyewitness at once and is the most common lineup procedure in use by law enforcement. A sequential lineup, on the other hand, is one in which the witness is shown only one person at a time but with the expectation that there are several lineup members to be shown (Wells & Olson, 2003). A lineup’s functional size is the number of lineup members who are “viable” choices for the eyewitness. For example, if the eyewitness described the culprit as being a tall male with dark hair and the suspect is the only lineup member who is tall with dark hair, then the lineup’s functional size would be 1.0 even if there were 10 fillers. Today functional size is used generically to mean the number of lineup members who fit the eyewitness’s description of the culprit (Wells & Olson, 2003). Mock witnesses are people who did not actually witness the crime but are asked to pick a person from the lineup based on the eyewitness’s verbal description of the culprit. They are shown the lineup and are asked to indicate who is the offender. Mock witnesses are used to test the functional size of the lineup (Wells & Olson, 2003). Among variables that affect eyewitness identification accuracy, a system variable is one that is, or could be, under control of the criminal justice system, while an estimator variable is one that is not. Estimator variables include lighting conditions at the time of witnessing and whether the witness and culprit are of the same or of different races. System variables include instructions given to eyewitnesses prior to viewing a lineup and the functional size of a lineup. The distinction between estimator and system variables has assumed great significance in the eyewitness identification literature since it was introduced in the late 1970s . In large part, the prominence of this distinction attests to the applied nature of the eyewitness identification literature. Whereas the development of a literature on estimator variables permits some degree of post diction that might be useful for assessing the chances of mistaken identification after the fact, the development of a system variable literature permits specification of how eyewitness identification errors might be prevented in the first place (Wells & Olson, 2003). The criminal justice system relies heavily on eyewitness identification for investigating and prosecuting crimes. Psychology has built the only scientific literature on eyewitness identification and has warned the justice system of problems with eyewitness identification evidence. Recent DNA exoneration cases have corroborated the warnings of eyewitness identification researchers by showing that mistaken eyewitness identification was the largest single factor contributing to the conviction of innocent people (Wells & Olson, 2003). Psychological researchers who began programs in the 1970s, however, have consistently articulated concerns about the accuracy of eyewitness identification. Using various methodologies, such as filmed events and live staged crimes, eyewitness researchers have noted that mistaken identification rates can be surprisingly high and that eyewitnesses often express certainty when they mistakenly select someone from a lineup. Although their findings were quite compelling to the researchers themselves, it was not until the late 1990s that criminal justice personnel began taking the research seriously. This change in attitude about the psychological literature on eyewitness identification arose primarily from the development of forensic DNA tests in the 1990s (Wells & Olson, 2003). More than 100 people who were convicted prior to the advent of forensic DNA have now been exonerated by DNA tests, and more than 75% of these people were victims of mistaken eyewitness. The apparent prescience of the psychological literature regarding problems with eyewitness identification has created a rising prominence of eyewitness identification research in the criminal justice system. Because most crimes do not include DNA-rich biological traces, reliance on eyewitness identification for solving crimes has not been significantly diminished by the development of forensic DNA tests. The vast criminal justice system itself has never conducted an experiment on eyewitness identification (Wells & Olson, 2003). Multicollinearity can be quite a problem in archival/field research, because it can be very difficult to sort out which (correlated) variables are really responsible for observed effects. The control of variables that is possible in experimental research can bring clarity to causal relationships that are obscured in archival research. For example, experiments on stress during witnessing have shown, quite compellingly, that stress interferes with the ability of eyewitnesses to identify a central person in a stressful situation. However, when Yuille and Cutshall (1986) studied multiple witnesses to an actual shooting, they found that those who reported higher stress had better memories for details than did those who reported lower stress. Why the different results? In the experimental setting, stress was manipulated while other factors were held constant; in the actual shooting, those who were closer to the incident reported higher levels of stress (presumably because of their proximity) but also had a better view. Thus, in the actual case, stress and view covaried. The experimental method is not well suited to post diction with estimator variables—that is, there may be limits to generalizing from experiments to actual cases. One reason is that levels of estimator variables in experiments are fixed and not necessarily fully representative of the values observed in actual cases. In addition, it is not possible to include all interesting and plausible interactions among variables in any single experiment (or even in a modest number of experiments). Clearly, generalizations to actual cases are best undertaken on the basis of a substantial body of experimental research conducted across a wide variety of conditions and employing a wide variety of variables. Nevertheless, the literature is largely based on experiments due to a clear preference by eyewitness researchers to learn about cause and effect. Furthermore, ‘‘ground truth’’ (the actual facts of the witnessed event) is readily established in experiments, because the witnessed events are creations of the experimenters. This kind of ground truth is difficult, if not impossible, to establish when analyzing actual cases (Wells et al. 2006). The world is complex. All natural situations or scenes contains infinitely more physical and social information than the brain is able to detect. The brain’s ability to record information is limited. In studies of immediate memory for strings of numbers that have been read once, it turns out that most people begin to go wrong if the number of single digits exceeds five (Nordby, Raanaas & Magnussen, 2002). The limitations of what humans are capable to process, leads to an automatically selection of information. This selection is partially controlled by external factors, the factors in our environment that captures our attention (Magnussen, 2010). In the witness psychology we often talk about the weapon focus, in which eyewitnesses attend to the weapon, which reduces their memory for other information (Eysenck & Keane, 2010). The selection of information in a cognitive overload situation is also governed by psychological factors, the characteristics of the person who is observing. It is about the emotional state and the explicit and implicit expectations of what will happen. Psychologists call such expectations cognitive schemas. Cognitive schemas forms a sort of hypotheses or map of the world based on past experiences. These hypotheses or mental maps of the world determines what the brain chooses of the information, and how it interprets and if it will be remembered. When information is uncertain or ambiguous, the psychological factors are strong (Magnussen, 2010). Bartlett (1932) explained why our memory is influenced by our expectations. He argued that we possess numerous schemas or packets of knowledge stored in long-term memory. These schemas lead us to form a certain expectations and can distort our memory by causing us to reconstruct an event details based on “what must have been true”(Eysenck & Keane, 2010). What we select of information, and how we interpret information is partially controlled by cognitive schemas. Many cognitive schemas are generalized, and for a large automated and non-conscious, as the expectation that the world around us is stable and does not change spontaneously. Such generalized expectations are basic economic and making sure we do not have to devote so much energy to monitor the routine events of daily life, but they also contribute to the fact that we in certain situations may overlook important, but unexpected information, or supplement the memory with details who is form consistent, but who actually don´t exist (Magnussen, 2010). First, estimator variables are central to our understanding of when and why eyewitnesses are most likely to make errors. Informing police, prosecutors, judges, and juries about the conditions that can affect the accuracy of an eyewitness account is important. Second, our understanding of the importance of any given system variable is, at least at the extreme, dependent on levels of the estimator variables. Consider a case in which a victim eyewitness is abducted and held for 48 hours by an unmasked perpetrator; the witness has repeated viewings of the perpetrator, lighting is good, and so on. We have every reason to believe that this witness has a deep and lasting memory of the perpetrator’s face. Then, within hours of being released, the eyewitness views a lineup. Under these conditions, we would not expect system variables to have much impact. For instance, a lineup that is biased against an innocent suspect is not likely to lead this eyewitness to choose the innocent person, because her memory is too strong to be influenced by lineup bias. On the other hand, when an eyewitness’s memory is weaker, system variables have a stronger impact. Psychologists have investigated the effects on identification accuracy of a large number of estimator variables, witness, crime, and perpetrator characteristics. Here we recount findings concerning several variables that have received significant research attention and achieved high levels of consensus among experts (based on items represented in a survey by Kassin, Tubb, Hosch, & Memon, 2001) or have been the subject of interesting recent research (Wells et al. 2006). Magnussen, S., (2010). Vitnepsykologi. Pålitelighet og troverdighet I dagligliv og rettssal. Oslo: Abstrakt forlag as. Nordby, K., Raanaas, R.K. & Magnussen, S. (2002). The expanding telephone number. I: Keying briefly presented multiple-digit numbers. Behavior and Information Technology, 21, 27-38. Wells, G.L., Memon, A., & Penrod, S.D. ( 2006). Eyewitness Evidence. Improving Its Probative Value, 7(2), 45-75. This page was last edited on 4 February 2019, at 03:13.